This entry was posted in Blog, Front Page Item, Production Updates on February 22, 2015 by '63 Boycott. 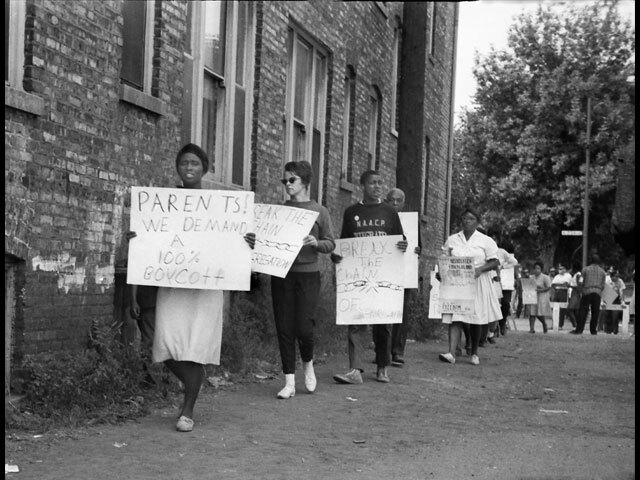 Thanks to new funding from the Richard H. Driehaus Foundation, ’63 Boycott is back in production and continuing to identify more particpants from the 1963 boycott in our photo gallery and letting people know about the 1963 boycott. Most Chicagoans have never heard of the massive civil rights protest about education inequality. We have new photos on the site from Art Shay and Allan Koss, and a few slideshows to make it easier to look through the pictures both on phones and computers, and we identified a photo of Rosie Simpson, at a 73rd and Lowe protest that preceded the October boycott by a few months, as well as a photo of youth CORE president, Charles Smith. Last fall, Gordon and Rachel participated in a panel for the American Friends Service Committee event as part of the exhibition Boycott! The Art of Economic Activism. They asked if we can make the work in progress and eventually finished film available to travel nationally with the exhibit of boycott posters. Tracye, Rachel, and Gordon also screened the work in progress and engaged in discussion with the University of Illinois at Chicago Documentary Studies Working Group. The group regularly examines the link between documentary work and traditional scholarship and creates spaces where an interdisciplinary group of thinkers and practitioners can share work and exchange ideas. 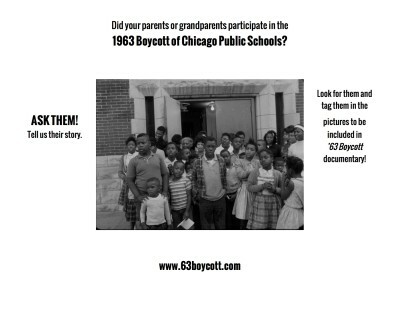 This inspired us to throw together the flyer above, and pass it out to Chicago Public School students all over the city. We passed them out to 1300 youth at Louder than a Bomb’s Crossing the Street event here in February, The School Project events, and the Civil Rights: Yesterday, Today and Tomorrow conference organized by the Chicago SNCC History Project. At the conference, youth and civil rights veterans got together to talk about the past and future of public education and black struggles in Chicago. There was a special screening of WTTW’s Bird of the Iron Feather, television’s first black soap opera created by Clarice Durham’s husband, Richard Durham. What does the 1963 Boycott have to do with the mayoral election? According to our friend Steve Bogira at the Chicago Reader, racial segregation in Chicago is the most important issue that no one is talking about in the mayoral election. Under pressure, see who finally did talk about it here.